We are nearly at the end of our two week wholegrain goodness challenge. This really has become a change that we will be sticking to. Even my hubby has automatically gone from wholegrain alternatives when he was out shopping! We are loving the new flavours that the wholegrain alternatives are bringing to our meals. However we haven't really noticed any of the health benefits, I have noticed that I have not felt as bloated and that's about it! But I am sure that it is doing us good! Everybody had their usual breakfasts and are certainly enjoying the wholegrain cereals! The twins and I had a finger food lunch of cheese on wholemeal toast and wholemeal Sunbites. Hubby took his wholemeal sandwiches and a banana and oat wholemeal cake. 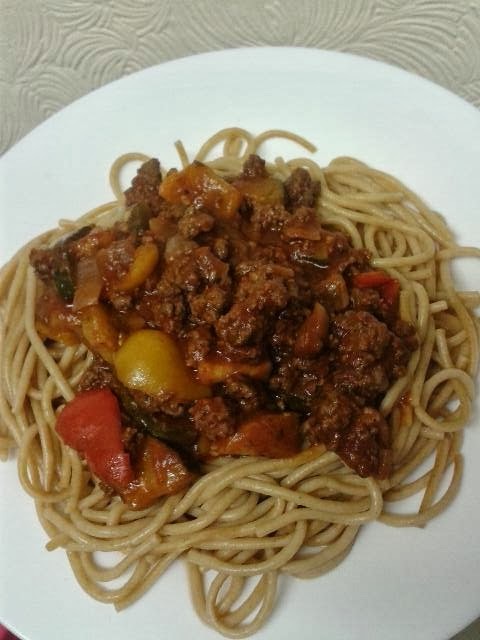 Last night I made a delicious chunky vegetable spaghetti bolognese served with organic wholegrain spaghetti. We all enjoyed this for our dinner and love the added flavours that the wholegrain spaghetti gives! Joseph had a bag of wholegrain Sunbites for his after school snack.